So yesterday I took down Euler problem 1. Yeah, I’m just that good. In fact, only something like 250k of the entire world population (7 billion or so) got it right. That’s not even including people like Santa Clause. Elite level, here I am. I would tell you what the second question asks, but that would mean I read it correctly the first time around. What I read was something like “Add up all even Fibonacci numbers up to the four millionth Fibonacci number.” Cake! Right off the bat I was going to do this tail recursive style, ’cause that’s the way an elite programmer like me does it. Now, I know I’d seen the cannon version of how to get the Nth Fibonacci number, but I chose to blaze some trails. (And I forgot what the cannon version was) The idea was instead of doing that whole (n – 1) and (n – 2) nonsense. So to start there is 0 and 1. Then 1 and 1. Then 1 and 2. Then 2 and 3. Every iteration has a sort of shift where the right parameter becomes the left, and the new right was the old left + right. Sounds like a really easy recursion problem. Only thing missing is an iteration used to find the Nth Fibonacci. That will just be reduced by one every iteration until it hits 0. Â Once that happens, the last number is returned. Which, by the way, is 24157817. So now I have a way to get the Nth, it’s time to add up all evens up to the 4 millionth Fibonacci number. Oh yeah. ;;And this is an update that keeps adding up the even Fibonacci numbers and stuff. Now the site gave me the first 10 numbers: 1, 2, 3, 5, 8, 13, 21, 34, 55, 89. So adding up the even numbers in that list gets… eh… Oh! 44. Well time to see if the above bit of lisp works. Yay. Well that’s easy. Next 4 million. Now the fun part about that solution is that I will never get a stack overflow. Bad part is that I have no idea how long it would take to add up 0 -> 4 millionth Fibonacci number. So at that point I was thinking I would have to somehow create a tree structure of parallel operations. Start with 4000000 / 2 and find the total in those two. To do that, I would halve those, and then halve again… ect, and sum up everything while traveling back up the tree. Or is it down? Whatever. I couldn’t believe how *(@#ing hard this second problem was. That was when I re-read the problem. Turns out I was supposed to add up every even up to 4 million. So the Fibonacci number closest to 4 million. Not the 4 millionth Fibonacci number. Then it seemed to be back to what I would expect for the second problem. Basically every number found that is even, add it to the sum. That is until the right number is greater than 4 million. (Which would make the left number too high on the next iteration) At that point, add the left (If even), and return the sum. And guess what? It worked. Now this wouldn’t be a lisp post if I didn’t add in some macro for over kill. After I failed to add up all even numbers up to the 4 millionth Fibonacci, I thought that maybe if I put them all in a list, and then added them up: magic would happen. Magic did happen, I killed the heap. I mean if adding two really big numbers was killing lisp, having a bunch of lists full of large numbers being added together should be fine, right? Make perfect sense. HOWEVER, one interesting thing did come from that: A macro. Here’s the original function for the array adding, pre massive tree idea. This just puts all into a list. I didn’t even get to the adding part. Well I figured instead of just having a method call fibl to add all the numbers, just make a macro that would call fibl to get the list, then run an eval to add them all together. Why settle for simple, when a macro can make it way more complex. Although in my defense, when using macroexpand-1, I get to see the whole list of numbers before they are added. A list of Fibblenibble numbers. That was a lot for just one problem. Oh and for fun, here is the original golden function when adding all evens up to the 100000th number. So for the something of it I am going to see how far I can get in the Euler Project Problems (Not sure if I should have capitalized “problems”). Basically finding solutions to questions no one has ever asked. If nothing else, this is a way to further my Lisp knowledge… so yes, this is in Lisp. Hide the children. First problem is simply to add up all the numbers that are multiples of 3 and 5. It’s like a more boring version of FizzBuzz. Apparently that is possible. Because the preceding method depends on the current’s answer, that method call has to sit in memory. If end = 10000000… Stack overflow. Oh yeah. Now some languages have something called “tail call optimization” which basically means all useful information is passed into the next method. IE the preceding method isn’t waiting for a return, because it supplied the next method with everything. The big difference here is that every iteration sends all information forward… as in there is no return “x + someMethod(…)” call that leaves the previous iteration on the hook for the current function’s return. Yay. Why does that matter? ‘cuz. Fine. Some languages are smart enough to forget about the previous call, because it no longer has a use. Kind of like garbage collection. So to attack the original problem at hand, I used a simple tail recursion strategy. Every iteration with push the next number to check, and the updated total to the next. Of course this wouldn’t be a post by me if I didn’t over complicate it… MACRO TIME! You might have read my macros primer thing (Most likely not), so this shouldn’t be to hard to understand… right?? Where “3”, “5”, and “7” are the numbers to check if the current number is divisible by. Pretty sure that made sense… Ok, so! And here’s what it looks like expanded. Remember, with macros there’s a step where you can create more code BEFORE the final expansion. What that line says is to take all the values in args (3,5,7,9), and create a “(= 0 (MOD CURRENTNUMBER X)” where X is 3,5,7,9. For people more familiar with c#, pretend you are creating a string. Or something like that. The difference is lisp is creating actual code, not strings. Anyways, that’s it. Yeah. This is awkward. You might be wondering a great many things as you begin to read this most epic of epic things. I can only give you some of the answers you seek, and some that you don’t even know you need. I’m mysterious like that. A while back I made a rather involved step by step example on how to do Test First design. Luckily I took down some good notes, and made a plethora of images to document the whole thing. I’m glad I did, since I did this about 4? months ago. Far beyond my 1 day long term memory. Basically it’s a step by step process on how to Test First validating a string based Social Security Number. Now most people would just copy and paste some obscenely long regex string, and call it a day. I’ll assume you aren’t that guy, because if you are; I wish the internet had a door so it could hit your $@@ on the way out. Why shouldn’t you use regex? Oh I don’t know. Could be have to do with it looking like something I could produce with a keyboard and a nerd rage session. Or it could be that regex is understood by (approximately) .0000000000000001% of the programming population that most of it remains untouched for decades “cause it werkz”. (I’m not bitter though) Not saying all regex is bad, just when it’s used for something as complex as a Social Security Number. Also, it makes for a reasonably short post… which I’ve already wasted 2 minutes (To 5 minutes depending on your reading level) of your life with. Efficient! 1: It will return false if the string is null. 2: It will return false if there are any characters. 3: It will ignore dashes. 5: It will require a length of 9. Are these all the rules? Sort of. There are actually some government based rules about what can be where, and were I not so lazy I would include them. However, that they even exist makes regex even more convoluted and/or impossible. Ok since this is test first, a test has to be made first. Boom. Well at least the shell. Why isn’t there code yet? Because right now it’s just about creating just enough to get it to “compile”, or at least in this case get a useful test failure that doesn’t #@!Q$% about a method that doesn’t exist. I know that seems sort of weird. After all, how often do you actually try to fail? Other than doing a really bad job of painting a room so that you’ll never be asked to again. Well in Test First you want a failure. In fact a success first can cause panic at times, because it might mean that your test is jacked or useless. For example: If I knew my test should expect a non null return based on a specific rule, and I haven’t added the rule yet. If it runs green, than it’s very possible the test isn’t written correctly, or that your tested code is returning something it shouldn’t. Good thing this isn’t true for the current test. Be happy, you can now prove to your mom that failure is good! This is probably the hardest concept to get in testing. The idea is, as the rule suggests, do just enough to get the current test to go green. That is the rule if it is the first or fifth test. So at this point, what will make it go green? Well remember that the first rule is “It will return false if the parameter is null.” So… send it a null, and return a true. Ok so next on the list is: It will return false if there are any characters. Ok so now there needs to be code to make this go green. Sounds reasonable enough. This is a hard rule to get someone to understand. After all, if private methods aren’t tested, how can one be sure they work? The answer is: Because you’re testing the public method that is using said private method, the test suite by association tests the private methods. If anything is wrong with the private method, it will make the tests for the public one fail. Besides, in this case the “contains_a_character” method is nothing more than taking code out of the main method, and slapping a method signature on it to help with readability. One small thing that may be of interest is the return line. Most people would have just used a for loop. Start at the first dcharacter, walk each one, and break on the first non number. I am not most people, unless most people are defined as “recursion friendly”. Essentially I call the “contains_a_character” method over and over, with each call taking one character off the original string. This lops off the first character in the string (or grabs everything other that the first character), and calls the “contains_a_character” method all over again. Taking the first item of a list is usually referred to as “head”, “first”, or “car”. Taking all but the first is usually refereed to “tail”, “rest”, or “cdr”. In the end, for small string it’s up to you. check. Time to run that test again. Alright, so now it checks for null and non numbers. Awesome. Two more to go. Ok, now something to ignore dashes. Personally I’d rather irraticate them all, but they breed like rabbits. Pretty straight forward. Call the method with dashes, and expect it to show more tolerance for dashes than I have. Making the test a better man than I. And it failed. Please say you weren’t surprised by the result. Now for the code to fix it. Ok so once again there’s some trickery going on here, so I’ll break it down. A lot more typing. Because the plainText = ar… part is encased in a pair of parentheses: the statement is run, plainText is given a new value, and that value is evaluated with the rest of the if statement. And since the if statement is done left to right, by the time it gets to the “!contains_a_number(plainText)” section of the if statement, plainText already has its new value. &*#@! Ok so something is wrong. How do I know? I’m smart like that. The question is: Why did it fail? After all, the whole thing is based on the replace method. Time to dive into that. To do that in chrome you need to open the developer tools. OR just press CTRL + SHIFT + J. tHATS… That’s the easier way. Next it’s a trip to “sources” land. Hrmmmmmm still looks like it has dashes in it. Turns out that replace only replaces the first instance. Learned that from the Google. After doing some searching on that, I came across This post. Basically it shows that using replace with a regular expression is the preferable way to remove all the dashes. Once again, this is a recursive call. If the stringToCopyFrom text has no length, return cleanedUpText. What’s cleanedUpText? It’s the string that will grow for every time the method is called recursively. The idea is to construct a new string that has no dashes by walking through the original string, and adding any non dashes to the cleanedUpText string. So for every “iteration” the first character is checked to see if it’s a dash. If it is, then ignore it and pass through the current value of cleanedUpText as the second value of the method call. If it isn’t, then append the current character to the current cleanedUpText, and send that through as the new cleanedUpText value. The main reason I’m pointing this out is that even though I had decided at the time the solution I had was good (I has = I stole); possible improvements can always be sought. Yes I know, I’m not as perfect as you thought I was. Now for the last step: Length check. So once again, the test is created first. As you can see, there are three assertions in the one test. It could be argued that they should be three separate tests since it should be a 1:1 ratio. Or it could be argued that even though there are three assertions, they work the same. Another possibility would be to combine all three into one statement by using &&. Apparently once again my laziness got the better of me. Looks like only two failed, as they should have. After all, a string of 9 letters has no reason to fail with the given code. This is another reason why the test could be split up. One that checks to make sure the “happy path” works (9 numbers), and the other to make sure any other length fails. Alright. Hard to type why simultaneously patting myself on the back. So this means we’re done, right? Hell no.The best part is next: Refactoring. The goal will be to abstract away a lot of the code into methods with very English and readable names. Next is to remove some code from the main method. What happened there? I removed the “isARealSocialSecurityNumber” variable since it only held the result of the truth check. This is questionable since it could be argued that even though the “isARealSocialSecurityNumber” might have been extraneous, it helped convey the intention of the method. Personally, I’m fine with reducing that down to only a truth check. So if the argument is empty, false is evaluated. This means the second half of the ? : will return the actual arugment string. This is not a true/false value. That part of the if statement will now return “false” if the “argument” is empty/null. Now the entire “contains_a_character” is one if statement return. Basically, when one is refactoring, one should not just look for code improvements. Renaming methods to make their intention known is incredibly important. Renaming them so they could be understood by those things we call “business analysts” means someone with any experience with reading can immediately pick up what the method is doing. Much nicer than what it was before. One more abstraction, and now even a child could understand. Well a child that can read. Probably not a baby. Yay for the final green. Now there are more rules for a social security number, but this had been more than enough to waste your time. I’ll spare you from any further harm. I used this last line to get a full copy that will have the thumb drive automatically be the master so future pushes will need only “git push”. 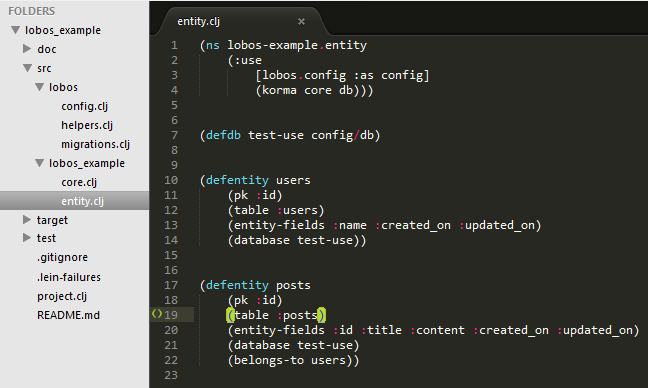 SqlKorma is a really nice Clojure DSL for handling things like selects, inserts, but not deletes. Ok, so that’s a lie, it can do deletes too. What would be really useful is if I had a project already setup for all to view. Maybe even something up on github. This is totally not a link to it. The next step is to add the dependency for SqlKorma to the project.clj file in the project root folder. Â Depending on how old this post is, the version may not be correct. Now it’s time to create the entities that will match the already existing tables. Â If you’ve never used an ORM before, this is simply spelling out to SqlKorma what the tables are, their columns, and their relationships. Â However, this is not done with any SQL statements. Â In fact, the point of this file, and SqlKorma in general, is to create a high level representation of the persistence layer. Â Whoa, that got serious fast. Â Basically, you are using class like entities so that you can easily query, or persist stuff, without caring about anything database wise. Nothing all that complicated. Â As you can see, there is an insert, assertion (is (empty?…. ), and a delete. One other note for those like me who are just picking up Clojure, there are two :use/:require keywords of note in this other note…note. Â If you look at the :require block you’ll see the :as keyword. Â This is basically an alias to help with keeping typing down. Â There might be other reasons, but I’m not the one to ask. Â So don’t. Â Not kidding. The second keyword is the : only keyword (So annoying that I can’t put the : near the o since it makes a :o). 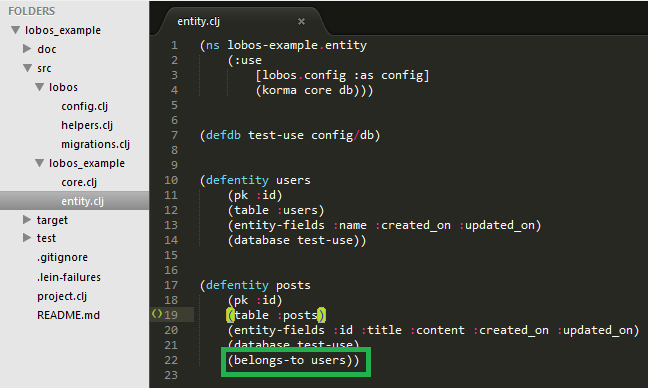 Â This allows you to only use the parts of the namespace you need. Â It wasn’tÂ necessaryÂ in this project example, but I threw it in anyhow. Â So live with it. Ok so now everything is ready (Pretty easy huh?). Â All that’s left is to prove that I am awesome, and now you have a small bit of said awesome. Â Just open a command prompt (windows key; type in cmd; hit enter), and navigate to the project root directory. Â Then type lein test. OH EM GEE FAILURE!!! Â That’s right, you just failed to win. Â Or won by failing. Â Or something actually clever. As you can see, the reason it failed is that I had the test asserting that the select won’t bring back anything. Â However, since I had the insert command, it brought back one user. Â And that’s a working SqlKorma example. If nothing else, this is just a checklist for myself that I’m allowing you, due to my giving nature, to use if you need. This is a very simple bullet point thing. Got help from this post. 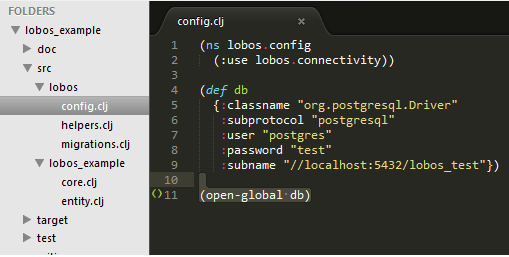 Those two last commands should get you everything you need to run the Clojure Repl. Code for this project is on github. So you want to test in Clojure, huh? Well good thing you found this oasis of awesomeness. Getting a test up and running is pretty easy, but involves a few simple steps that I will stretch out to the point of pain. Still with me? Good. Now for the test creation. As you can see, I added a file with a test. What you might notice, or cause panic, is that I don’t have a file to test with this test file test. And that’s ok, because we’re @#$%ing this $@#% up Test First style. Basically, create a test, and then create what it’s supposed to test. I won’t get into Test First here, but just wanted to calm your concerns. Ruh roh. Looks like that file that isn’t in existence can’t be tested. Weird, right? Oh well, time to create it. There are a couple points at this eh point. You will see that I added a file named “simple_math.clj” to the “test_example” folder. Something I found out while I was creating this little gem of a tutorial; Apparently the convention for a folder is to use a _ where a class in a file uses a -. So as you can see, the folder “test_example” translates the namespace part “test-example”, and “simple_math.clj” becomes “simple-math”. 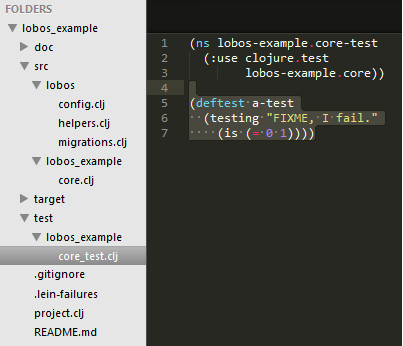 From what I can tell, since I am pretty new to Clojure, lienigen will try to resolve the namespace of “test-directory.simple-math” to “test_directory/simple_math”. I assume this is part of the “convention over configuration” school of thought. Since I come from a .net background where conventions just don’t exist, it caught me off guard. Anyways, since that is done, it’s time to run the test again. And things are looking a lot better. I’ll move to an actual post soon. Why would you want to do that? Readability if nothing else. Yeah… so there it is… I got nothin’ else… this is really awkward. Sean: Ooo talk dirty to me. Jay: mud pie!… dust bunnies!! !